As you may have noticed – if you are active in social media in any way – mom jeans are all over again, which I really love. They are so much comfier than skinny jeans, they are so fun to style, and they remind me of friends, which is soo great, because honestly, is there anything better than Rachel Green’s style? Despite of that, when I got my first mom jeans, I had some difficulties to combine them. And since they are so popular now, I thought I’d show you my favorite ways to wear them for some inspiration, at least I hope so. You know how one of the style guide lines is to combine a wider shirt to a tight jeans? This one works here too, only the other way around. 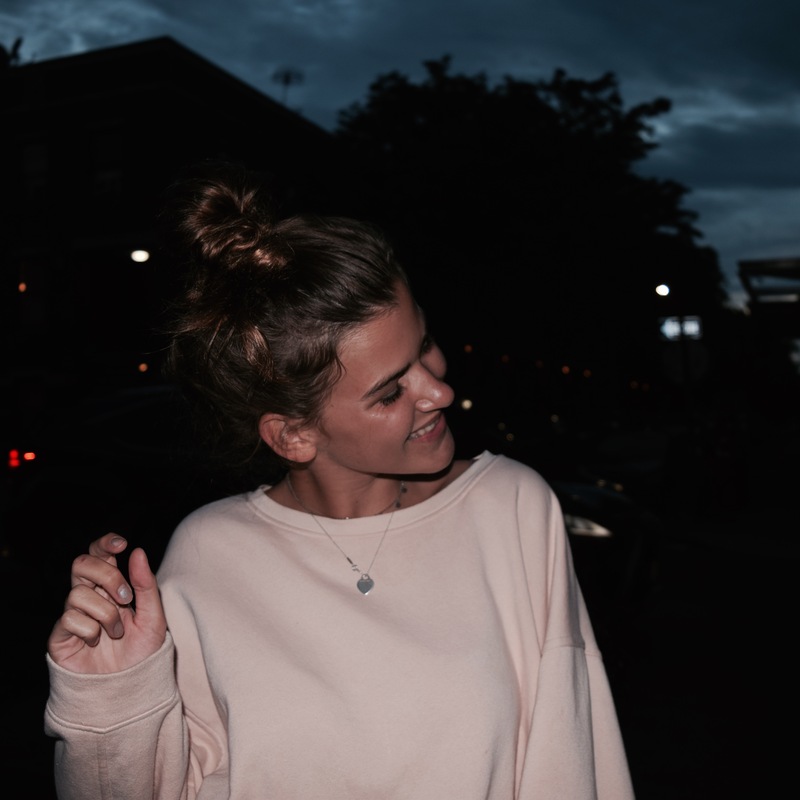 I love wearing mom jeans to simple light long sleeves or t-shirts, it is like the most basic combination ever. Suiting this, I like to just add a pair of sneakers, but you can totally pep it up with some printed jeans or fancy slippers too. I love the combination of a white Shirt and blue jeans with sneakers so much! The top is from only, the shoes are Adidas, the jeans are ZARA. Stripes are the best, they literally go with anything, same for mom jeans. Besides, they add a little fun to the basic outfit, if you feel like going crazy, haha. I even wear my flower printed mom jeans with a striped shirt, I don’t know why, but it works. The top is from h&m, the shoes are vintage. The Shirt is from brandy melville, love this one. The Shirt is second-hand ZARA. Especially during colder seasons (autumn I love you), I really like wearing pullovers with mom jeans. I don’t think (or at least lets pretend) that you can go comfier than with the combination of pullover and mom jeans. The pullover is from ZARA, it’s the best one on earth, I swear. The pullover is from ZARA (new collection), it’s my favorite one for fall. With pretty much every mom jeans being high waisted, you can’t go wrong with a crop top. And if you’re anyway like me, you may have a bunch of cropped tops you never wear in the back of the closet, because they don’t really work with other trousers – well now is the perfect opportunity. The top is Urban outfitters (it’s my sisters, creds to her, I borrow way too much), the shoes are supergas. 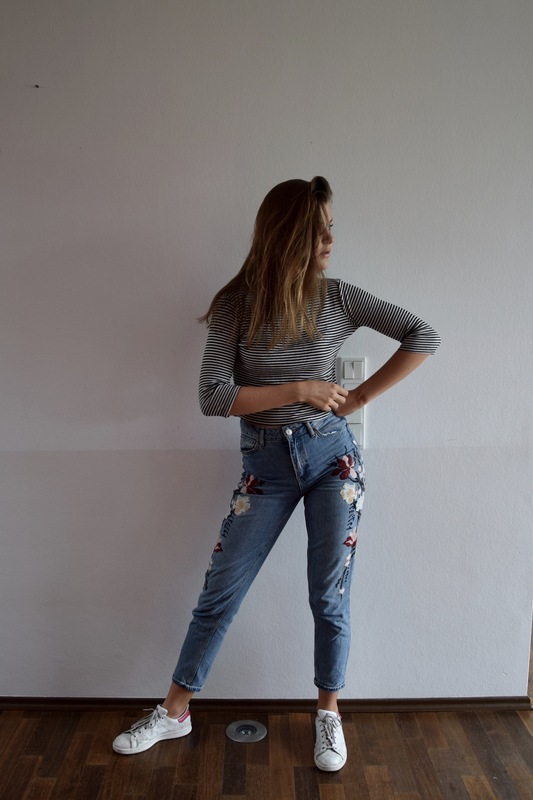 Because they don’t really underline ones feminine side (even if they are called mom jeans, haha), I would love wearing them with something a little fancier, especially because I really like wearing different styles mixed together. Give me some heels, a clutch and a blouse with the mom jeans and I am totally happy. The combination of mom jeans and heels is just so great, I can’t wait to wear it. Now I just have to find an occasion, which fancy enough for a seventeen year old to wear high heels to, life is so hard. The top is from american vintage, the shoes are ZARA (I do shop there too often, I get it). Your flower printed mom jeans is just great! The flowered Mom jeans are super cute with a big sweater, especially for fall! Love your blog. It’s so cute. Can’t wait to read more! Excellent blog you have here but I was curious about if you knew of any discussion boards that cover the same topics talked about in this article? I’d really love to be a part of group where I can get feed-back from other knowledgeable people that share the same interest. If you have any suggestions, please let me know. Many thanks! Hi! Thank you a lot. Spontaneously, I can’t think of any discussion group you described, I am so sorry. Do you mean one whose topic is blogging or fashion?